Wow, has it been ten days since I posted? Sorry about that, I’ve been busy. And sleeping. I try to get up early EVERY morning, but sometimes I have long days, and I end up taking a nap. Despite my best efforts, I gotta sleep–and that messes up everything. It’s what happens when you have no set routine, or let go of one. If I won the lottery and were self-funded for life, I wouldn’t worry about it. The HeatCageKitchen garden is in need of a good weeding, but I don’t feel like going out there right now. It’s best to do that kind of thing after the sun goes down, or first thing in the morning (as if!) so that it’s not burning hot. The three Meyer lemons are still there and growing bit by bit, but I can’t find the little lime buds anymore–I’m guessing snails or possums, which roam the property and go pretty much wherever they like. I think they really like my place, but I can’t seem to catch them to let them know they’re not welcome. The eggshells have helped but are not infallible for deflecting slugs, so I put a border brick under the pot holding the basil. Looks like the basil is getting big enough to where it’s too hard for them to <burp> feast on the pungent leaves. I have more eggshells to crush up and drop outside, I just haven’t done it yet. But I’ve been watering, much as I can, and everything is doing fine. Granted, they are the size of the top digit of my little finger, but they were delicious. The plant has more buds, flowers and berries in various stages of development. 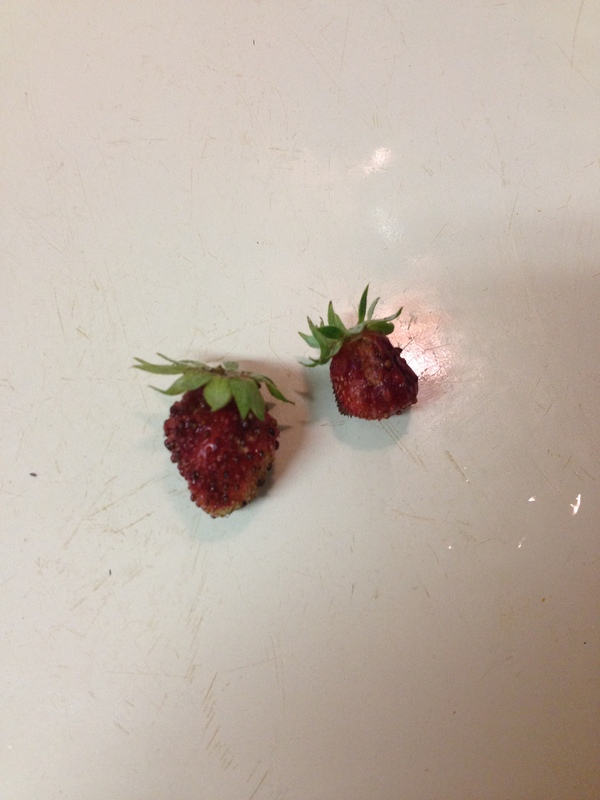 They look weird, but they’re really strawberries. Maybe the additional sunlight will make them grow in normal. So, last week I was making some food in the HeatCageKitchen and realized that I am running low on a particular salt/spice blend that I used to, ah, “import” from Louisiana. In other words, when I went to visit, I’d buy three or four of them and bring them back to use. Time to order more. However, over time, like a lot of things called “Cajun” will do, this particular item has started to appear in Houston, and I thought I’d seen it one day, but couldn’t remember where. Guess what? It’s available at my HEB, along with the crab boil! The Cajun Seasoning with the green lid is the one I like. I’ve been buying it for years, but the last time I imported some was. . .2008, while i was there after evacuating for Hurricane Ike. So it was time to buy more, although I’m not completely out yet. What I thought I’d be doing is ordering it online, which you can, if you can’t get this in your local grocery store. HEB will order something unusual for you if you fill out a form, but they will also ask, “will you buy a case of it?” However, it’s also easy to order online (There are also recipes using their products on the site.) You can see all of their products at their website, as well as the parent company’s website, Deep South Blenders. I’ve bought products from Deep South Blenders as well, but it’s been a while. 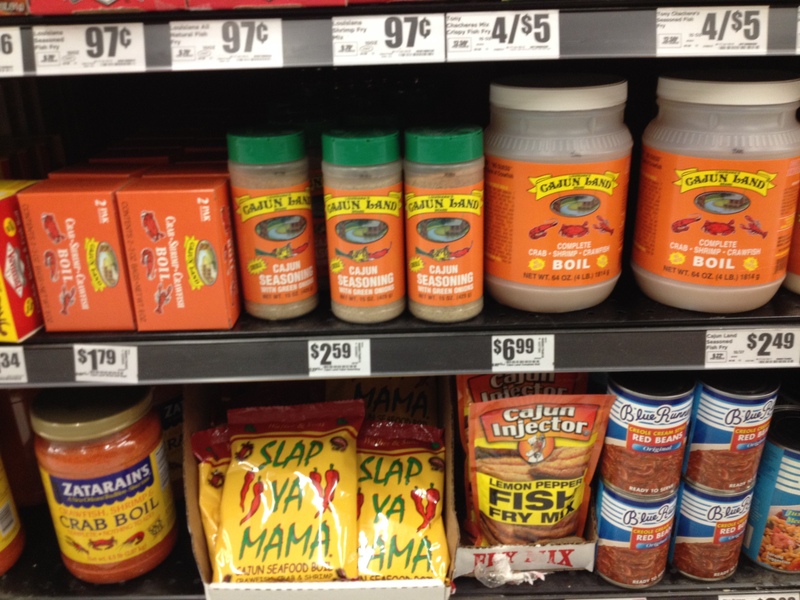 It’s a local brand, so it’s in every grocery store in the Metropolitan New Orleans area. As you can see, Cajun Land Cajun Seasoning is NOT grossly expensive, either. That’s a 15 ounce bottle. NOTE: How much you use is up to you, but don’t dump a lot into your food until you know how much of it you’d like at one time. It’s got a bite, but it’s not too spicy. But too much of anything with heat can burn you. Unless you grew up in Texas eating jalepenos and Scotch bonnet peppers for breakfast. . .go slowly until you find how how much you like. My favorite way to use it is on frozen veggies right before I put them in the microwave. A sprinkle of Cajun Land, a touch of salt, some butter, olive oil or unflavored coconut oil on top and it’s perfect. I add salt, because I don’t want to add too much of the Cajun Land to get the salt taste. And I started doing the unflavored coconut oil when I had to do the yeast-free diet many years ago, and I just keep doing the same thing, because it’s so good. Note: Zatarain’s WAS a local New Orleans brand, but is now owned by McCormick’s. If you don’t believe me, go do a search for it. So I decided to ring the company, which, I didn’t realize, is 1.4 miles away from where I used to live in Metairie. No kidding! They’ve been there for a long time, and I walked in that neighborhood for 7 years and didn’t even realize they were there. DUH. So what is this magic mix? It’s a salt-based spice blend, with dehydrated onion, garlic and green onion (you know, what everyone else calls “scallions”) paprika and red pepper, as well as what they call “spices.” It’s salty, it’s spicy, but not burning hot like hot salsa is. A nice rounded flavor with a little bit of bite. Now, one ingredient is called “spices.” You know what that means–it could be anything, right? So I rang the company and asked about it. Any guess what the first question was? Dear Readers, that’s REAL NEW ORLEANS. No kidding. And Craig is a really nice man, answered all my questions and he didn’t mind me asking, either. Craig came back to the phone and told me that although the proprietary spice blend is indeed gluten free, they do have some wheat in the facility, and the possibility of cross-contamination does exist, however small the amount. So, if you are highly sensitive to gluten, use at your own risk. But as anyone who looks for gluten additives will tell you (and Dr. Davis, the Wheat Belly guy) it’s always better to ask. Many prepared food products, including spice blends, use gluten or gluten components for filler, thickener, or some other chemical purpose. Anyone who has ever had a reaction from “just a little bit” knows what that means. Craig spoke proudly of their 40-year history, and the work they do to have Cajun Land products in places like Houston, and they are working on having the products available in more stores, like Kroger and Food Town. While their website is functional, they are also working on a complete update, so that’s it’s a little more modern. It’s functional, but, a bit, well, 1990’s (by Craig’s own admission!) The day I called they were doing some work on the network, so I tried not to tax him too much. Turns out his brother Kevin Barron is also a food blogger in South Carolina and also has a company called Muffuletta Media. I hope Craig wasn’t too offended when I laughed at the name–I just thought it was cute, nothing more. If you’re not familiar with the New Orleans classic meal, well, it’s a great big sandwich. No, the muffuletta is NOT gluten free, either. I can’t tell you the last time I sunk my teeth into one, and thank heavens I don’t live there anymore. Writing about it there would send me to the French Quarter to get one. I can just see folks in South Carolina trying to pronounce that. In New Orleans, most (including me) say “muff-ah-LAH-tah,” but there are a few other pronunciations around, too. So if you’re looking for a little something new to add to your spice rack armory, consider Cajun Land Cajun Seasoning with Green Onions. Inexpensive and easily available, it might just be your next big thing. Posted by Amy on June 12, 2014 in Considered opinions, Grocery Shopping, Ingredients, Special considerations, Trends, What's for Dinner? Thanks for your post and for mentioning your conversation with my brother, as well as PeeDeeFoodie.com and Muffuletta Media, LLC. We hope to get Kraig’s new Cajun Land Brand website updated soon, as you noted. It works well, but its been out there a while that’s for sure. I’ve shared your post on our social media channels. Holler if we can ever be of service! So glad you both stopped by and enjoyed my article! Thank you for the nice article about Cajun Land and pee dee foodie.